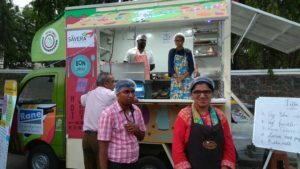 On April 3, V-Excel Educational Trust, an NGO for special children based in R.A.Puram launched its newest initiative called ‘Tiffin Times’ – a mobile food truck at Luz Church Road, opposite to Amrutanjan Healthcare Limited. Young adults with special needs are handling the truck with the help of some volunteers. The volunteers are also students of V-Excel who are undergoing teacher training course here. The trust focuses on providing lifespan services to individuals with special needs. It is run by founder-trustee Dr.Vasudha Prakash. “The primary objective of this project is to provide avenues for job placements for our trainees with special needs in the food and hospitality sector. We are planning to train and place 100 trainees in a span of three years under this project. And ultimately we aim for their social inclusion,” says Gayathri Suryanarayanan, who heads the project. Earlier the truck was stationed at Shastri Nagar, Adyar, and Thiruvengadam street, R.A.Puram for a few days. “The project took its shape last year when we got the Rane Pioneer of Change award from Rane Foundation for our ‘Tiffin Times’ project,”she says. “At present, there are six trainees in the batch. They are working at the truck in a rotation. These trainees are trained in food safety, cooking, serving and hospitality depending on their interests, abilities/disabilities,” she says. The truck now serves healthy, tasty snacks and an assortment of beverages like veg poha, keerai pakoda, lemon mint juice, and buttermilk. They are priced between Rs.30 – Rs.50. “The menu will be different every day. It will be chosen based on the ease of preparation. And the revenue from the sales will be used to pay stipends to the trainees involved in the project,” she says. The truck will be at Luz Church Road near Marrybrown restaurant, opposite to Amrutanjan Healthcare Limited from 4 p.m. to 7 p.m. for two weeks (till April 13). People can volunteer to help young adults run the business. To volunteer contact Gayathri Suryanarayanan at 9884103767. This entry was posted on Thursday, April 4th, 2019 and is filed under Community, Restaurants, Food fest, Stores. You can follow any responses to this entry through the RSS 2.0 feed. You can skip to the end and leave a response. Pinging is currently not allowed.